I remembered seeing Berserk in Borders (when it was still open) about five years ago and being really interested by the pretty ambiguous back cover and also the front. Eyeballs with silhouettes reflected in them really interested me when I was eleven. I'm not sure why. Anyway, I recently came across it again in the City Library and luckily had my library card on me. Berserk opens with Chas, our narrator, having part of his finger cut off by his best mate, Devil. Lovely. When I first started reading, I kept thinking 'what does this have to do with the story?' It is mentioned quite a few times throughout the book and when the significance of Chas' finger is revealed, I was incredibly impressed because I never would have guessed. I really enjoyed the plot of Berserk, the mysterious and dangerous feel made for an exciting read. The way I see it, if you want to know what British boys really are like, then you should read this book. Although the action of the story takes place miles away from me, I could easily compare quite a few of the characters to people I actually know. To me, Chas and Devil are your typical British soap opera style trouble-makers. They nick off school, hang around the streets and are always in trouble with the police. I was pleased to know that Chas isn't all bad and actually owns a guilty conscience, unlike Devil who would probably never amount of anything. I picked up this book without even knowing that it is set in the UK. So when words like 'trainers', 'reckons' and, of course, 'Mum' started appearing I was pleasantly surprised. I haven't read into British fiction in a long time so it was nice to read in a British voice. Throughout Berserk, I was gripped by the suspense and the occasional macabre moment that made me squirm in delight. Ah, there's nothing like a good bit of violence that makes you grit your teeth. I enjoyed Chas' voice as a narrator, he sounds a lot like the boys that I know. I enjoyed his wit and thoughts that were embedded into the narrative. 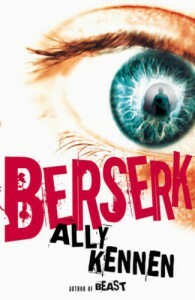 Overall, Berserk was gripping, dangerous and full of suspense. It made me squirm at parts and had me up late at night.